Serving the Muzzleloading community for over 25 years. Blacksmith and Armorer for the public, our military, television and movie productions, as well as major sports enterprises. We have several tomahawks in stock and ready to ship. Check out our thowing tomahawk page to find the Pay Pal buttons of what we have ready to ship. We rarely are able to get out to Festivals but we will be at this one below October 5th 2019 supporting Cancer research as one of the fine vendors in attendance. Come on out and met us in person at the Sarasota Pirates and Rum Festival. A variety of vendors will be in attendance. There will be Live Music, Exotic cuisines, Soul food and Rum brands from around the world. Mark your calendars and we sure hope to see you there! Join Us On Facebook By Clicking The Picture Below, It Will Direct You To Our Page On Facebook. Hit The Like Button There And Be One Of Our Many Friends. Facebook friends have the opportunity to see products first and are eligible for special sales. and be one of our many Google+ friends. All of our hand forged wares including our Throwing Tomahawks, Swords, Knives are made right here in our workshop in Cleveland GA, USA. We strive to make the most accurate replicas of pieces of our history. 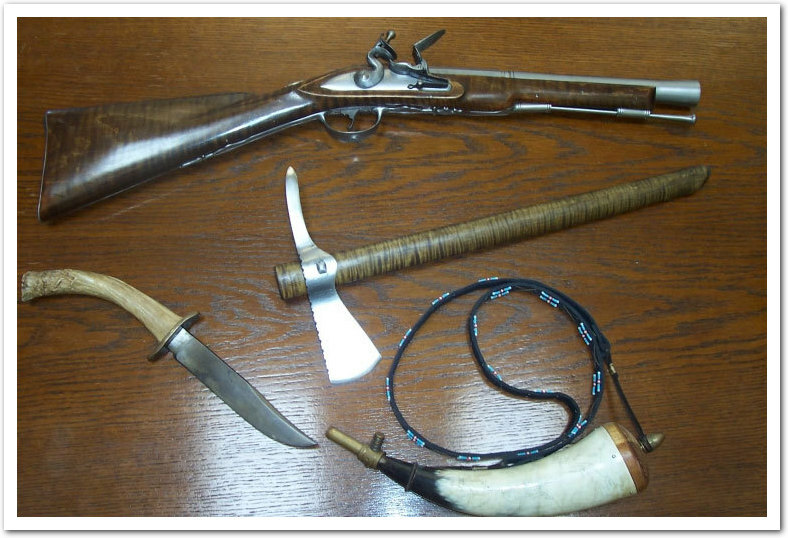 Makers of the Jack Horne Magnificent Seven tomahawk. Check our Sword page for the George Washington Battle Sword and other swords we recently completed including our new Jack Sparrow Sword. We would be honored to make you your next battle ready Sword. WE ACCEPT PAYMENTS BY CREDIT AND DEBIT CARDS. CONTACT US FOR PAYMENT DETAILS AND TOTALS. Welcome to Kings Forge and Muzzleloading where we make it our goal to serve you in the way you expect to be, but rarely are. Known worldwide as Blacksmiths of our history. The Forge work we do is painstakingly created using the time honored tradition of forge, hammer and anvil. Hand forging is a process in which steel is brought to very high heat and then carefully hammer formed over the anvil to the desired shape. This extremely difficult and labor intensive technique produces edged weapons of superior strength and stunning rustic character. Although intended for display and costume purposes, it should be known that these are real and functional weapons. Our throwing tomahawks and knives have the weight and balance characteristics of the originals and can be used as such. Skillfully hand made items from our forge are one of a kind and should never be compared to mass produced imports and wall hangers. We pride ourselves on selling useable replicas that are made to last a lifetime and beyond. Because most of our items are hand made there will be slight variations from one piece to the next. We stick to strict standards so variations are slight.